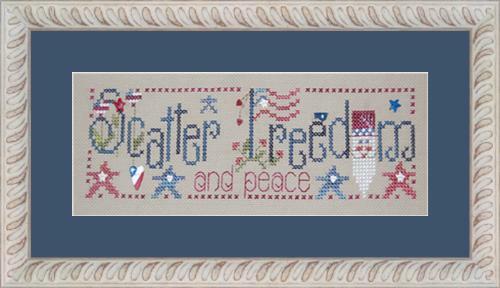 Nicole's Needlework: Scatter Freedom Finished! I got it finished up last night. It was such a fun stitch! great finish Nicole and of course in Nitro time! LOL I like that frame too! Um ya Nicole get over that because that is a most excellent choice for that piece! It's perfect for it! Order away! Fantastic finish and so quick. Love the frame you have got to buy it. Happy 4th July. Great finish - the frame would be perfect - go for it! Oh I love it!!! And the frame is perfect!!! I hope you get it! Do you frame your own pieces? I remember Khaki Davos! What fun! You're too much Nicole! Congrats! It's VERY cute! I love the frame you picked for the SB. You stitched that up so quickly! Great job. Terrific finish, Nicole! Looks so neat and just in time for the celebrations. Enjoy watching the fireworks! Great finish!!! Happy 4th of July! Happy July 4!! I just love Scatter Freedom! Yours even looks better stitched than the photo shows and I am so amazed at how quickly you stitched it!! I hope you have a fun day today!!! Beautiful finish!! The frame looks perfect, you really should order it.